twin oaks, originally uploaded by jahansell. 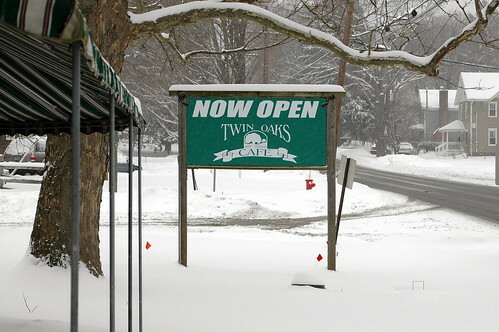 The Twin Oaks opened up a few months ago in the corner space formerly occupied by the Country Corner. They renovated nicely (though it seems much smaller now?) and serve a nice selection of family-friendly items. I'm due for a return visit - I've only stopped in a few times. I wish them long life and luck here - every town needs a place for a quick breakfast or leisurely brunch, and dinner on those nights when you just don't feel like cooking and cleaning up. The other new restaurant in town, Cafe Tazza, in the former Little Brick House building, is struggling and might not be around for very long. We should all contribute (from memory) all the names this location has had.